Business is all about relationships. 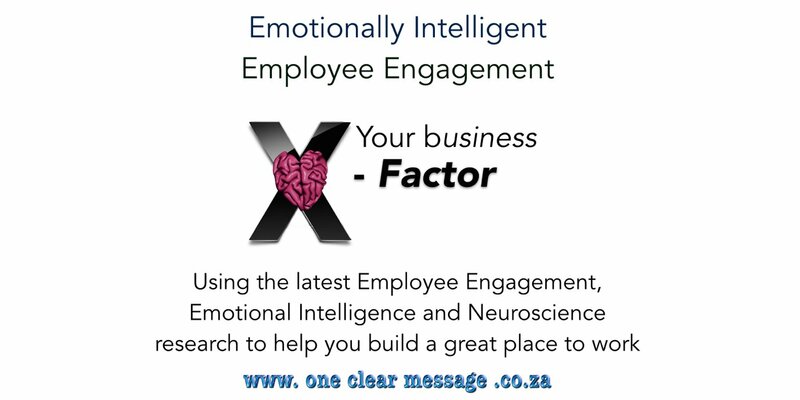 Emotional Intelligence skills help increase Engagement (internal relationships) and build better customer relationships (external relationships). Discern between emotions and their degree of intensity, thus are better able to manage our interpersonal relationships. This is an essential skill in environments that are constantly changing or that are emotionally charged. Describe and identify emotions providing more opportunities to be influential. When we are able to sufficiently appraise and describe our emotions we are more likely to exhibit more positive emotions and less non-verbal anger. This ability allows us to be perceived as approachable. Perceive and manage the emotions of others is important to our overall performance. Being able to consciously interpret the group’s tone, body language and degree of eye contact gives us a higher sense of awareness. Manage emotions which helps harness the energy needed to sustain motivation, cope with stress and make decisions. Be in the moment. When faced with personal, social and professional situations in which family members, friends, clients or colleagues become emotionally charged, we don’t allow other’s emotions to exert excessive influence. Express our emotions appropriately. This skills leads directly to the development of more meaningful interpersonal relationships. Recognise when it is necessary to activate an emotion compatible with the task’s demands (e.g. calm when studying, excitement when inspiring an audience). Manage change and solve problems of a personal and interpersonal nature based on their emotional state. Emotions such as anger, fear, empathy, happiness and sadness have been shown to impact the decision-making process. Have an awareness of what the “problem” really is and are able to pair it with an appropriate emotional state. Experience more pleasure in success. Celebrate success and the steps along the way. Take greater responsibility for the outcomes of their own actions. Learn from what we achieve and mistakes made. Crave feedback. Prefer to know about the level of our success and/or failures immediately. Take ownership of our motivation. Naturally seek ways to make most tasks personally relevant and meaningful. This intrinsic motivation results in the experience of positive emotions that often result in increased optimism and effective decision making. Be aware of our own strengths providing us with more opportunities to gain influence with others. We are attracted to and motivated to work with those who believes that they can make things happen. Assert ourselves appropriately helps us to manage others effectively. Skilled influencers are able to describe what needs to be done, which helps when setting proper direction and tone. Use positive emotions (both perception and expression) effectively to enhances our influence. Skilled influencers often use positive emotions (such as happiness, optimism, a smile) to engage others, which leads to increased approachability and desire for future relationships. This skill increases our personal networks and beneficial alliances. Employ a positive and confident disposition, this increases our likelihood of influencing others. Others generally perceive this disposition (in various environments) as energising and motivating. To measure and assess the levels of Emotional Intelligence in your team order an EISA test today. The first two skills Perceiving and Managing are the foundation of Emotional Intelligence and the other 3 skills (Decision making, Achieving and Influencing) build on these to create an engaged successful human being. A key driver of Employee Engagement is the relationship we have with our managers and when they are able to effectively manage their EI skills this relationship improves. Poor relationships are leading cause for loss of key talent in an organisation. EI skills are an Engagement necessity.